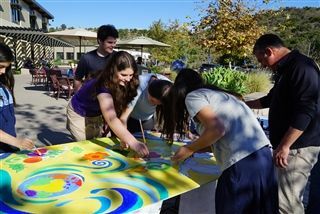 Students in Hands of Peace service learning group discovered that collaborative art is a great way to express peace and equality. The group worked with a local artist to design a peace mural, then all took a hand in painting it. The mural will be hung in the arts building as a reminder of the group's goals.